Understand Want to know more? 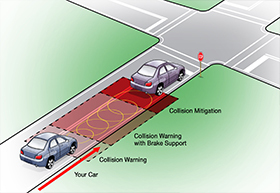 Deepen your understanding of Forward Collision Warning. Challenge Up for a challenge? Tackle a few challenging scenarios using Forward Collision Warning. Forward collision warning systems warn you of an impending collision by detecting stopped or slowly moved vehicles ahead of your vehicle. 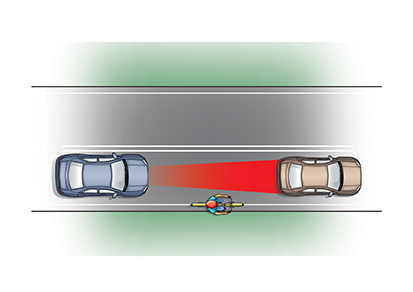 Forward collision warning use radar, lasers, or cameras to scan the road ahead while you drive. 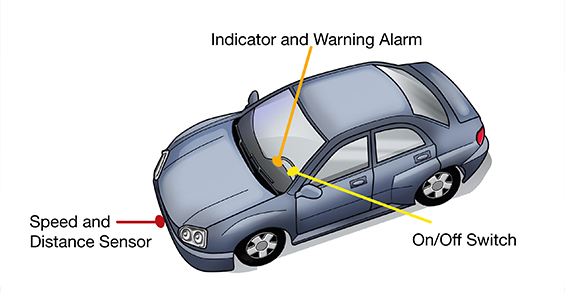 If there is an impending collision, the system will warn you of the danger using lights, beeps, vibrations of your seat, or a combination of these. Some systems may also tighten your seat belt and pre-charge the brakes, making it easier for you to stop as quickly as possible. Many vehicles with forward collision warning also quickly becoming equipped with safety technologies like automatic emergency braking. If your vehicle has automatic emergency braking it will urgently apply the brakes if you fail to do so in time to avoid an impending collision. While automatic emergency braking may not prevent every crash from occurring, the technology may help lessen the severity of a crash. Most forward collision warning systems are active by default at speeds greater than 10 mph. You can deactivate the system by pressing the forward collision warning system button or by accessing your forward collision warning settings via your vehicle’s information screen. Check your owner’s manual for details about your specific vehicle. 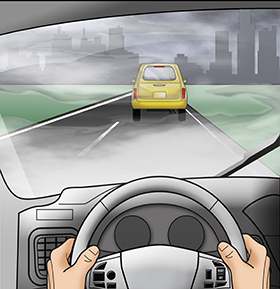 Always maintain a safe following distance from the vehicle in front of you. 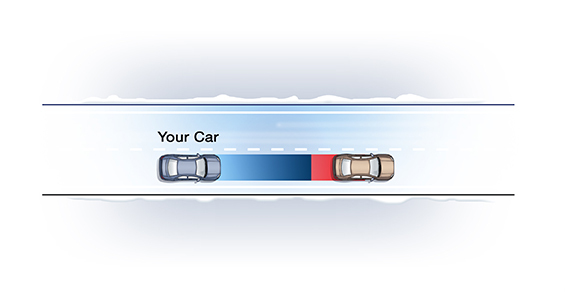 Your forward collision warning system is intended to warn you when you are getting dangerously close to the vehicle in front. 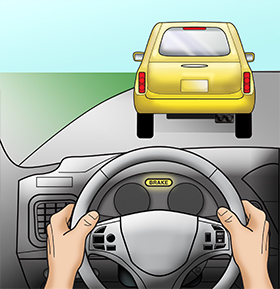 If you receive a warning from your forward collision warning system, or if it begins braking for you, be prepared to brake or steer to safety. Speed and distance sensors. Forward collision warning systems use both speed and distance calculations to help keep you safe. The most common type of distance sensor uses radar to detect traffic ahead of you, but some systems use lasers, cameras, or a combination of these. These sensors detect slow or stopped vehicles in your lane and warn you if a collision is likely. Looking under the hood: Radar-based systems. Let’s look at how radar-based forward collision warning systems work. Some forward collision warning systems send radar waves that reflect off objects in front of your car. Based on the radar reflection, forward collision warning uses your speed and the changing distance to the vehicle ahead to detect if a crash is imminent. Automatic Emergency Braking. 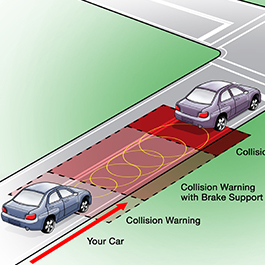 Some forward collision warning systems work together with Automatic Emergency Braking. If your vehicle has automatic emergency braking, the system helps you avoid a crash by urgently applying the brakes when a crash is imminent if you fail to do so in time. Your forward collision warning system may struggle on wet or icy roads because it is not able to adjust for road conditions. Wet or slick roads may increase your stopping distance, potentially causing your forward collision warning system to alert you too late to avoid a collision. Note in the image below that the forward collision warning system’s estimated stopping distance, in blue, is far shorter than the actual stopping distance, in red, due to bad road conditions. 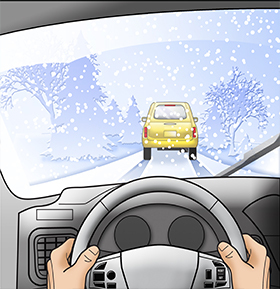 It’s important to note that the use of forward collision warning and automatic emergency braking is not advised during inclement weather conditions. Imagine you are driving a car equipped with forward collision warning and automatic emergency braking on an icy road following a snowstorm. Using the image to the right as a reference, think about the questions below. 1. If the car in front of you abruptly stops, how will your forward collision warning system respond? 2. What should you do to stay safe? Because of the icy road conditions, my forward collision warning system may not function properly. It is not able to adjust its estimate of my stopping distance based on road conditions, and so it may warn me too late. I should always be attentive and drive cautiously in order to avoid collisions. Some forward collision warning systems are not able to detect some obstacles or even vehicles because of their size or shape. When driving in areas where bicycles, motorcycles, and other small vehicles are common, you should not rely on your forward collision warning system. Imagine yourself driving the blue car on the city street to the right. Think about the questions below. 1. 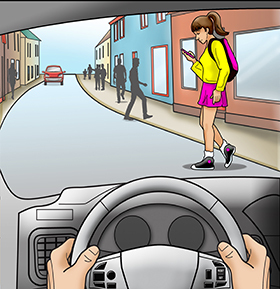 If the pedestrian in front of you crosses the street, how will your forward collision warning system respond? My forward collision warning system may not detect the pedestrian as he crosses the street, meaning I would not receive a warning. I should never solely depend on my forward collision warning system, but should constantly scan the road ahead to watch for pedestrians and other hazards. Many forward collision warning systems struggle to detect vehicles ahead of you when driving through snow, rain or fog. 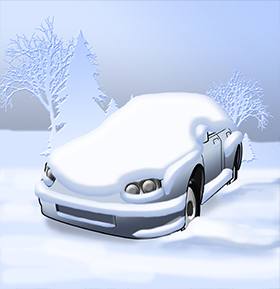 In these situations, your system may not be able to see through the falling snow. Similarly, your sensors may become covered by snow or ice during a storm, causing it to not function at all. After a snowstorm, you come outside and see your car covered with snow. Using the image to the right as a reference, think about the questions below. 1.What concerns would you have about your forward collision warning system? My forward collision warning system’s sensors are likely covered by the snow. When clearing the snow off of my vehicle, I should always make sure to clear any snow on the vehicle to ensure sensors are clear. This will allow the system to function appropriately. I should be especially mindful when using my forward collision warning system in these conditions, as emphasized by the Road Conditions challenge. 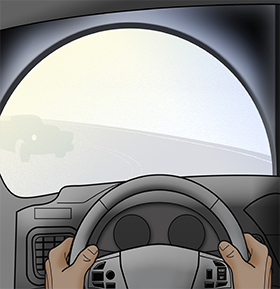 Some forward collision warning systems, particularly those that are laser- or camera-based, may not function properly during situations with glare or low light, or when lighting changes drastically. In the image to the right, for example, your forward collision warning system may struggle to detect vehicles while driving through the tunnel, as well as when the lighting changes abruptly at either end. Imagine yourself driving at dusk, as shown in the image to the right. Think about the questions below. 1. How will your forward collision warning system respond? 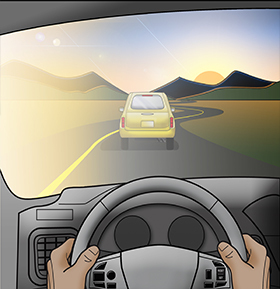 Because of the high glare (and overall low light) conditions, my forward collision warning system may not be able to detect the vehicles in front of me, so I should be especially cautious and constantly scan the road ahead.